There are two types of events you can use in VBA programming for Excel 2016 that are not associated with objects: time and keypresses. Because time and keypresses aren’t associated with a particular object such as a workbook or a worksheet, you program these events in a normal VBA module. In this example, the OnTime method of the Application object is used. This method takes two arguments: the time (0.625 or 3:00 p.m.) and the name of the Sub procedure to execute when the time event occurs (DisplayAlarm). This procedure is quite useful if you tend to get so wrapped up in your work that you forget about meetings and appointments. Just set an OnTime event to remind yourself. This particular code line could come in handy to warn you that you need to go home and get ready for the New Year’s Eve festivities. Here’s another example that uses the OnTime event. Executing the UpdateClock procedures writes the time to cell A1 and also programs another event five seconds later. This event reruns the UpdateClock procedure. The net effect is that cell A1 is updated with the current time every five seconds. To stop the events, execute the StopClock procedure (which cancels the event). Note that NextTick is a module-level variable that stores the time for the next event. The OnTime method has two additional arguments. If you plan to use this method, you should refer to the Help system for complete details. 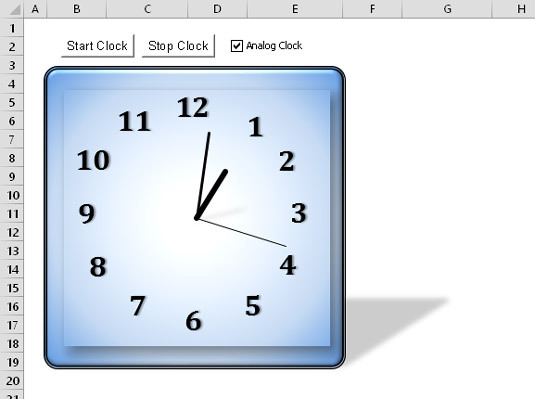 If you’d like to see a rather complicated application, check out this analog clock application. The clock face is actually a chart, and the chart is updated every second to display the time of day. Useless, but fun. While you work, Excel constantly monitors what you type. Because of this, you can set things up so a keystroke or a key combination executes a procedure. After setting up the OnKey events by executing the Setup_OnKey procedure, pressing PgDn moves you down one row. Pressing PgUp moves you up one row. Notice that the key codes are enclosed in braces, not in parentheses. For a complete list of keyboard codes, consult the Help system. Search for OnKey. In this example, On Error Resume Next is used to ignore any errors that are generated. For example, if the active cell is in the first row, trying to move up one row causes an error that can safely be ignored. And if a chart sheet is active, there is no active cell. Although you can use the OnKey method to assign a shortcut key for executing a macro, you should use the Macro Options dialog box for this task. If you close the workbook that contains the code and leave Excel open, the OnKey method will not be reset. As a consequence, pressing the shortcut key will cause Excel to automatically open the file with the macro. To prevent this from happening, you should include code in your Workbook_BeforeClose event code to reset the OnKey event.